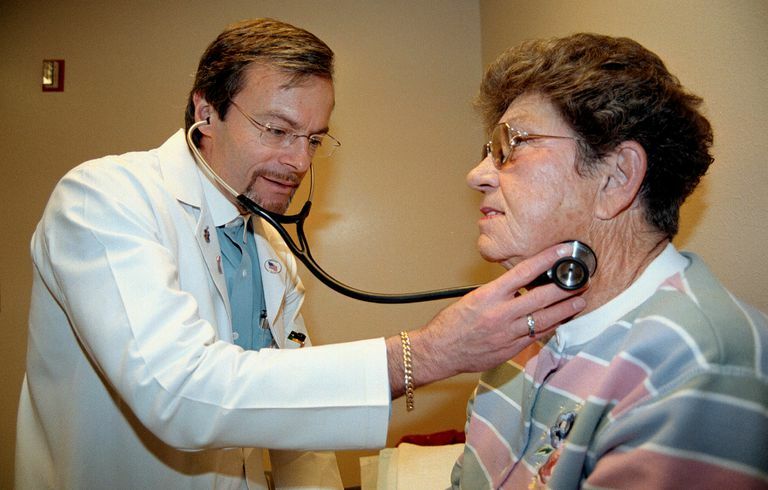 A pulmonologist is a physician who specializes in treating diseases of the lungs. Common conditions they treat include COPD, interstitial lung diseases such as pulmonary fibrosis, and asthma. They also work with oncologists to help manage people with lung cancer. Pulmonologists often perform procedures such as removing fluid from the lungs (thoracentesis), lung biopsies, and bronchoscopies. In addition to treating patients with medications and assisting with diagnoses, lung specialists play a very important role in helping people with lung disease live as well as they can with their condition. The area of medicine that studies diseases of the lungs is called pulmonology or pulmonary medicine. A pulmonologist begins her career with a 4-year undergraduate degree, often in a science field such as biology or chemistry. This is followed by 4-years of medical school. After graduating medical school, she will do a 3-year residency in Internal Medicine. After becoming board certified, she will then do a fellowship in pulmonary disease for 2 years or in pulmonary medicine and critical care for 3 years. In total, becoming a pulmonologist requires a minimum of 13 years of training after high school. Pulmonologists treat conditions related to the lungs, but not everyone with a lung problem sees a pulmonologist. For example, many people with mild asthma are cared for by their pediatrician, internist, or family doctor. Pulmonologists are most often involved in treating complicated lung diseases and cancer. A thoracentesis is a procedure in which a needle is inserted through the chest wall to withdraw fluid from a pleural effusion.There are many causes of pleural effusion, and this procedure allows the pulmonologist to take a sample to send to the lab. The procedure may also be done because of a fluid buildup in the pleural space that is resulting in poor breathing. (The pleural space where these effusions exist lies between the two membrane layers (pleura) which surround the lungs. Pulmonary function tests include several tests that evaluate breathing and how effectively the lungs are taking in air and how well air is diffusing from the small airways into the circulation. Technicians usually perform the tests which are then interpreted by a pulmonogist to help diagnose or monitor lung diseases. Some lung biopsies are performed by pulmonologists whereas others may be performed by a radiologist or surgeon. For those who have a collapsed lung (pneumothorax) or pleural effusion that needs draining, a pulmonologist can insert a chest tube into the space between the membranes lining the lungs. A bronchoscopy is a procedure in which a flexible tube is inserted into the mouth and down the trachea into the bronchus to look for any abnormal tissues that might be cancer. A biopsy is sometimes done during a bronchoscopy with the help of an ultrasound machine (an endobronchial ultrasound). You may see a pulmonologist as part of a lung cancer team who will help guide you through lung cancer. Most people who are diagnosed with lung cancer today are cared for by several doctors in what has been coined "multidisciplinary care." This allows each specialist to use their own expertise to maximize your care. Your pulmonologist may assist in making the diagnosis of your cancer, but can play an important role throughout your care. She can help determine if you are a candidate for lung cancer surgery, and if you are, can work with you to maximize your breathing capacity after the surgery. With more advanced lung cancers, pulmonologists can make sure your have the treatments needed to breath as well as possible despite a cancer being present. Pulmonologists provide care for people with a number of different lung conditions. While many people see a pulmonologist while trying to obtain a diagnosis, these physicians have the expertise to help you keep breathing as well as possible no matter the condition involving your lungs. American Thoracic Society Documents. An Official American Thoracic Society/European Respiratory Society Statement: The Role of the Pulmonologist in the Diagnosis and Management of Lung Cancer.